The Climate Reality Project (originally The Climate Project) began in Tennessee, USA, in June 2006. The movie An Inconvenient Truth, featuring former US Vice President Al Gore, awakened people around the world to the dangers presented by rising levels of greenhouse gases in the atmosphere. Mr Gore, whose work earned him a Nobel Peace Prize in 2007, decided to expand his long-running solo campaign to train people of all ages, sharing his concern about climate change. 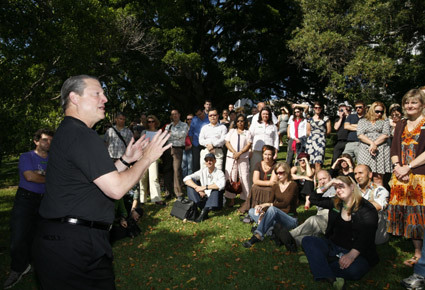 In November 2006, Al Gore came to Australia to open the first Climate Project organisation outside the United States. In that meeting and subsequently, Al Gore has personally trained hundreds of Australian presenters in a program administered in this country by the Australian Conservation Foundation. Climate Reality is an international non-profit organisation with a mission to increase public awareness of the climate crisis at a grassroots level worldwide, helping ordinary people understand what it’s about and what they can do to help turn things around. Since its founding in 2006, it has grown to more than 5000 volunteer presenters well-equipped to discuss the science and impacts of climate change. Together they have delivered more than 70,000 presentations, reaching a global audience of 7.3 million people. In 2010, Climate Reality sponsored an event in Beijing, where Mr Gore trained 300 new volunteer presenters. Climate Reality is now active in 57 countries around the world, with official branches in nine countries: Australia, Canada, China, India, Indonesia, Mexico, Spain, the U.K. and the U.S.
A number of Climate Reality presenters are based in Tasmania, in the North-West, North and South. If you live in Tasmania and would like to have a Climate Reality presentation for your school, community or workplace group, email Sustainable Living Tasmania or telephone 6234 5566. This is a voluntary program and the presentations are free of charge, although assistance may sometimes be requested for longer-distance travel, accommodation or other incidental expenses.